Newly published research suggests a new strategy to control cellular identity and fate, revealing that depleting or knocking out a chemical tag on RNA keeps embryonic stem cells in suspended animation. A team of scientists that included researchers from UCLA has discovered a novel mechanism of RNA regulation in embryonic stem cells. The findings are strong evidence that a specific chemical modification, or “tag,” on RNA plays a key role in determining the ability of embryonic stem cells to adopt different cellular identities. The team also included scientists from Harvard Medical School, Massachusetts General Hospital and Stanford University. Published in the journal Cell Stem Cell, the research reveals that depleting or knocking out a key component of the machinery that places this chemical tag — known both as m6A and N6-methyladenosine — on RNA significantly blocks embryonic stem cells from differentiating into more specialized types of cells. A key property of embryonic stem cells is their ability to differentiate into many specialized types of cells. However, instead of marching toward a specific fate when prompted by signals to differentiate, embryonic stem cells that have reduced ability to place m6A become stuck in a sort of suspended animation, even though they appear healthy. Yi Xing, a UCLA associate professor of microbiology, immunology and molecular genetics, led the informatics analyses and was a co-corresponding author of the paper. Other corresponding authors were Dr. Cosmas Giallourakis, an assistant professor of medicine at Harvard Medical School and Massachusetts General Hospital, and Dr. Howard Chang, a professor of Stanford University’s School of Medicine and a Howard Hughes Medical Institute investigator. The study of naturally occurring chemical modifications on RNAs is part of an emerging field known as epitranscriptomics. The m6A tag is the most commonly occurring modification known to scientists; it is found on RNAs of thousands of protein-coding genes and hundreds of non-coding genes in a typical cell type. The tags may help regulate RNA metabolism by marking them for destruction. Little was known about the dynamics, conservation and function of m6A in human or mouse embryonic stem cells when the authors began the project. The authors analyzed which RNAs were tagged with m6A and the location of the m6A modifications along RNAs in mouse and human embryonic stem cells. The investigators then found a strikingly conserved requirement for the presence of normal levels of m6A for differentiating embryonic stem cells into multiple cell types. Depletion of METTL3, a gene encoding the enzyme that places the m6A tag on RNAs, severely blocked human embryonic stem cells from differentiating into the gut or neural precursors. Deletion of the mouse METTL3 gene also led to a severe block in the ability of embryonic stem cells to differentiate into neural and cardiac lineages. 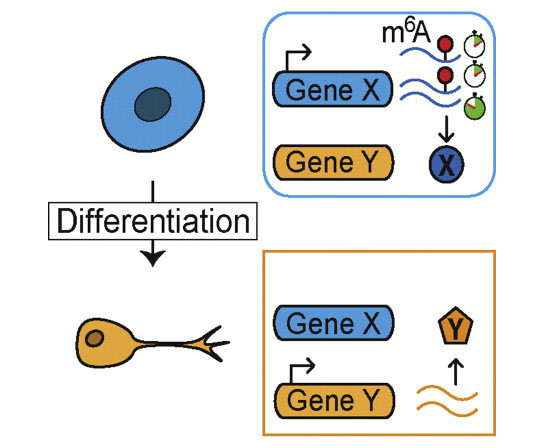 The study suggests that m6A modifications on RNA make the transition between cell states possible by instructing the cells to physically degrade those RNAs marked by m6A in embryonic stem cells, to allow the cells to become another cell type. However, if the cells can no longer tag RNA for destruction, the cells lose the ability to change. This discovery sheds new light on gene regulation in stem cells. Among the research’s potential applications, the development of chemical inhibitors of the METTL3 enzyme may help maintain stem cells undifferentiated for medical research and biotechnology applications. In the long run, this could be a step toward substantially less expensive stem cell research protocols. Other authors were Alan Mullen at Harvard and Massachusetts General Hospital and Marius Wernig at Stanford’s School of Medicine. Lead authors were Pedro Batista at Stanford, Benoit Molinie at Harvard Medical School and Jinkai Wang, a UCLA postdoctoral fellow. The research was supported by the Eli and Edythe Broad Center of Regenerative Medicine and Stem Cell Research at UCLA, the California Institute for Regenerative Medicine, the National Institutes of Health, Massachusetts General Hospital, the Damon Runyon Cancer Research Foundation, the Alfred Sloan Foundation and the Howard Hughes Medical Institute. Image: Pedro J. Batista, et al. Be the first to comment on "Research Reveals New Strategy to Control Cellular Identity and Fate"